Happy Sunday Dolls! It’s no surprise that today’s post is Halloween inspired. While your little, or not so little, ones are Trick-O’-Treating – assuming you don’t have to chaperone – enjoy the evening while sipping on a glass of “Rich’s Brew.” Peep the mixology below. The Mixology. Place five to six large ice cubes in a large wine glass. Add two to three slices of blood orange. 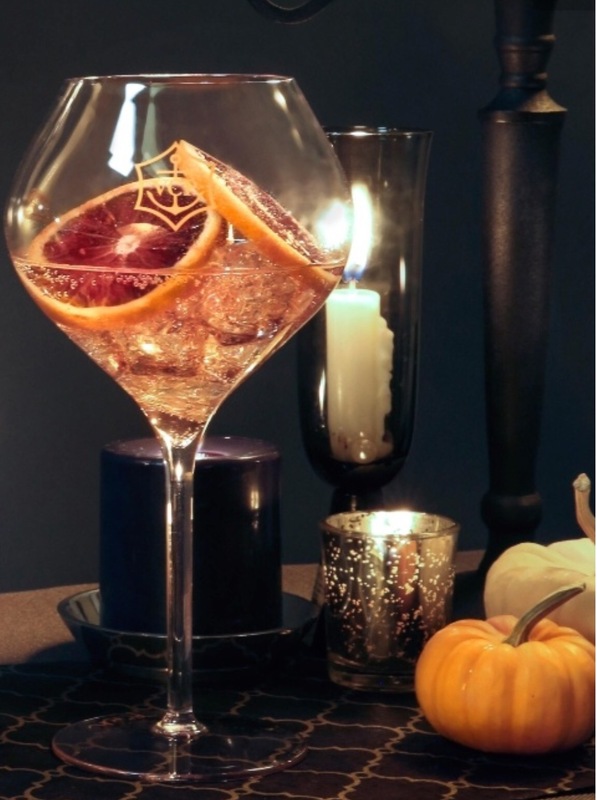 Finish with chilled Veuve Clicquot Rich and serve in your most ghoulish wine glass. Chin chin! A trend has hit the high-end designer community – personalization of luxury handbags. Some of the most iconic luxe brands have added to the air of exclusivity by offering personalization services; allowing customers to have a one-of-kind handbags, replete with their own initials. The Edie Parker Bespoke clutch has become the red carpet season “it” clutch. Designed by Brett Heyman, the most fashionable Dolls can select from the line’s vintage-inspired acrylic clutches and make it their own by adding the personalization of their choice (up to 7 letters). Use the design widget to style your dream clutch. Personalized monogramming dates back to an era of luxury rail travel when initials, family crests or colors distinguished pieces of luggage. It was the foundation of Louis Vuitton’s business in the 19th century and largely catered to upper-class society. Louis Vuitton’s personalization service Mon Monogram customizes select pieces from the Monogram Canvas Collection. SLGs, the Speedy, Neverfull, Keepall and Rolling Luggage – are available for personalization. LV lovers have a choice of up to three letters and vertical or diagonal stripes in 17 different colors. Handbags take up to eight weeks to customize. Goyard also offers hand-painted personalization services. All monograms are designed with exclusive paints made with strictly natural pigments. Up to four initials can be added to your Goyard, with over 17 color combinations from which to choose, as well as a wide selection of strips. Bags take anywhere from two to eight weeks to complete. Prices vary depending on your design selection. To help you with your selection, the personalization widget allows you to design you bag and check out the look before making the purchase. Lately I have been swooning over the Fendi made-to-order Selleria Intrecciato Handbag. According to Fendi, at the end of the ’40s, the Intrecciato was born out of Adele Fendi’s desire to make bags soft and versatile. The technique, borrowed from the fur world, consists of thin strips of leather woven together and stitched entirely by hand. Peep the ultimate fashionista, SJP, in the city with her personalized Fendi. Also, be sure take a look at Bottega Veneta Initials, Longchamp Le Pliage Personalized and the Anya Hindmarsh Bespoke Collection. All of these fab bags can be customized from the brand websites, allowing you to shop and design at your leisure. Happy Sunday Dolls! I don’t know about your neck of the woods, but fall has definitely descended upon the East Coast. It was 80 degrees on Tuesday, but this weekend it’s been crispy, cool and windy. I actually love this weather – perfect for a fab turtleneck, leggings, riding boots and leather gloves. Also perfect for harvest drinks. Peep the details below for some decadent drinks for the fall. The Mixology. In a small dish, pour caramel sauce. In another small dish, pour cinnamon sugar. Dip champagne flutes into caramel to rim glass, then dip in cinnamon sugar. Pour apple cider, caramel vodka, and top with champagne into flutes. Garnish with an apple slice and serve. The Mixology. Rim a champagne flute with sugar. Fill cocktail shaker with ice, Vanilla Vodka, and orange or blood orange juice. Shake, then strain mixture into flute. You with Champagne, Cava, and Prosecco and garnish with orange slice. The Mixology. In a large pot, combine the apple cider, apple slices, orange slices, ginger slices and cinnamon sticks. Bring to a boil over high heat, then reduce heat and simmer for 5 minutes. Remove from heat and stir in the rum. Note: The apple cider mixture can be kept warm over low heat for up to 2 hours before adding the rum and serving. In my mind the barware in just as important as the cocktail. Here are some of my favorite stemless flutes. There you have it Dolls! Enjoy your champagne Sunday harvest drinks! Chin, chin! Think pink Dolls! It’s never too late to support breast research efforts with a simple purchase of a product from some of these fab and favorite beauty brands. La Mer ‘The Breast Cancer Awareness’ Lip Balm (Limited Edition). During the month of October, La Mer will donate $10 from each sale of the limited-edition Pink Ribbon Lip Balm to The Breast Cancer Research Foundation. Origins Drink Up Intensive. Origins will donate $5.00 from the purchase of this limited edition to the Breast Cancer Research Foundation. Le Métier de Beauté Limited Edition Faces of Beauty Kaleidoscope. Founded on the basis of providing the best products available, Le Métier de Beauté wanted to create something that every woman could cherish and enjoy with shades to brighten and illuminate every complexion. The Face of Beauty Kaleidoscope contributes to the cause with not only love from Le Métier de Beauté but with a donation of 30% of kaleidoscope sales to local nonprofit breast cancer organizations during the month of October. Estée Lauder Advanced Night Repair & Breast Cancer Pin.For each purchase of this Advanced Night Repair, Estée Lauder will donate 20% of the suggested retail price to the Breast Cancer Research Foundation® (BCRF) from September 2016 – June 2017. Shiseido Rouge Rouge Lipstick. For the 10th consecutive year, Shiseido Cosmetics America partners with Cancer and Careers to harness the Power of Pink in Honor of Breast Cancer Awareness Month. With every purchase of Rouge Rouge in Murrey, Burning Up or Crime of Passion, Shiseido will donate $5 to Cancer and Careers. Smash box Limited Edition Breast Cancer Awareness 24 Hour Photo Finish Shadow Primer. Giving is gorgeous! To support Breast Cancer Awareness Month, Smashbox dressed up their best-selling Photo Finish 24 Hour Shadow Primer with the iconic pink ribbon. Ralph Lauren Tender Romance Pink Pony Eau de Parfum Limited Edition, 3.4 oz. 100% of the profits from your purchase will be donated to reduce disparities in cancer care and ensure that treatment is available at an earlier, more curable stage. Clarisonic ‘Mia – Pink’ Sonic Skin Cleansing System.With your purchase of a pink CLARISONIC Skincare Brush, CLARISONIC contributes to the Look Good…Feel Better program, which helps women with breast and other cancers look their best and manage their treatment and recovery with greater confidence. Aveda Limited Edition Hand Relief™ Moisturizing Creme. $4 U.S. of purchase price supports cruelty-free research through The Breast Cancer Research Foundation. Dolls, we’ve not reached the end of October; and some of these limited edition purchases extend beyond this month. We’ve all been touched by breast cancer. Please join me helping to eradicate this insidious disease! Well actually I don’t; but am considering doing so. What am I talking about? Eyelash extensions. Lately, I’ve observed my Dolls, friends and fashionistas on the street donning and batting fabulously long and full lashes. Their secret? Eyelash extensions. I know I’m late to the game. But, I’ve yet to commit, because I have questions. How are they applied? Will they irritate my eyes? What happens when I rub my eyes? How do I remove my eye makeup? What happens when one (or two) fall out? Are they high-maintenance? How often do I need them touched up? And on, and on, and on. With so many questions, I decide to do a little research into “said” extensions. (Shout out to CA!) Peep what I learned during a consultation at the Four Seasons Spa Baltimore. Q. What are eyelash extensions? Lash extensions are natural looking mink, silk or synthetic eyelashes applied one-by-one to each individual natural lash. They are designed to provide the thickness and length that you may have not naturally inherited. Q. Can I select the length and fullness of the lash extension? Yep. Lash extensions come in any length, color, thickness and curvature you can imagine. Q. How are lash extensions applied? The extensions are applied with a waterproof, semi-permanent glue designed not to irritate your eye or natural lashes. Q. How long do they take to apply? It is my understanding that applying a full set can take anywhere from 2 – 3 hours. Q. How should eye makeup be removed? Eye makeup should be removed with a gentle eye makeup remover; being uber careful not to touch the lashes. You should also take great care not to get cotton fibers “stuck” in the lashes. Q. How much does it cost to have eye lash extensions applied? Anywhere from $125.00 – $400.00 depending on your choice of lash. Be skeptical of $20.00 lash applications. You get what you pay for. Q. What can be done to make the lashes last longer? If I’ve heard it once, I’ve heard it twice – sleep on your back? No seriously, sleep on your back. Again, be gentle when removing eye makeup. Resist the urge to touch, pull or play with them. Remember to keep your touch-up appointments, as directed by your lash stylist. And finally, do not try to remove the extensions on your own. Q. How often should they be reapplied? Most stylists recommend once every four weeks. Check out this article from Harper’s Bazaar – What’s it Like to Have Eyelash Extensions. You won’t be able to stop laughing. There you have it! Eyelash extensions 101. Armed with this information, I may just schedule an appointment and give ’em a try. I mean a Doll loves to accentuate the eyes! In the interim, its me and my mascara.I want to share with you two of my favs; both as samples. Now they are constants in my rotation. This mascara is absolutely amazing. I am more concerned with lengthening my lashes, than fullness. This lengthens beyond measure. But, for those Dolls interested in fullness, you also get that benefit. The secret? Amazonian Clay. This natural wonder’s properties have been known to restore hydration, as well as enrich color pigments, creating a volume-boosting formula with higher intensity and truer color. I love this mascara primer. As soon as it’s applied, you immediately see your lashes lengthening. It also works to hydrate and strengthen your lashes. Chanel suggests wearing it at night as a lash mask. I confess to being leery of trying this at first. No shade, but I tried a similar dual wand mascara – primer on one end and mascara on the other. Once the primer was on, it never wanted to come off. I was literally pulling it off of my lashes while showering. Needless to say, my lashes were being stressed and coming out. But, not the Chanel primer. It comes off easily with an eye make up remover. The perfect companion to the Nourishing Mascara Base is Le Volume de Chanel Mascara. I am using it in No. 10 – Noir, and have nothing but rave reviews. It’s easy to apply, lengthens, doesn’t clump, and removes easily. I have been picking up the Tarte less and less these days. What’s your favorite mascara? Do you lash? I’ll be back soon with an update on my extension experience! PS | Don’t forget to subscribe by email to The Pretty Domestic, like us on Facebook and Follow us on Twitter. Until then, keep sharing the pretty! Good morning Dolls! You are cordially invited to champagne Sunday, the New Orleans edition! Why New Orleans? Only because business has me traveling there on a monthly basis throuhout the remainder of year. An added plus – my sister lives there, which allows my to see and taste all things indigenous to The Big Easy. I’m on the road again this week, and after client meetings I want to try New Orleans’ signature cocktail, the Sazerac Cocktail. A little background. 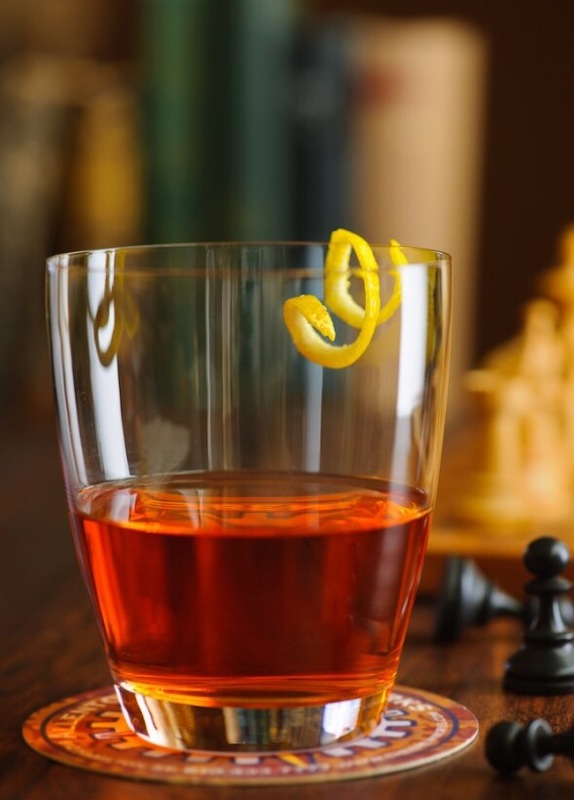 In 1838, Antoine Peychaud, a Creole Apothecary, created the drink in a French Quarter bar and named it for his favorite French brandy, Sazerac-de-Forge et fils. In 1873, the drink was changed when American Rye whiskey was substituted for cognac, and a dash of absinthe was added by bartender Leon Lamothe. 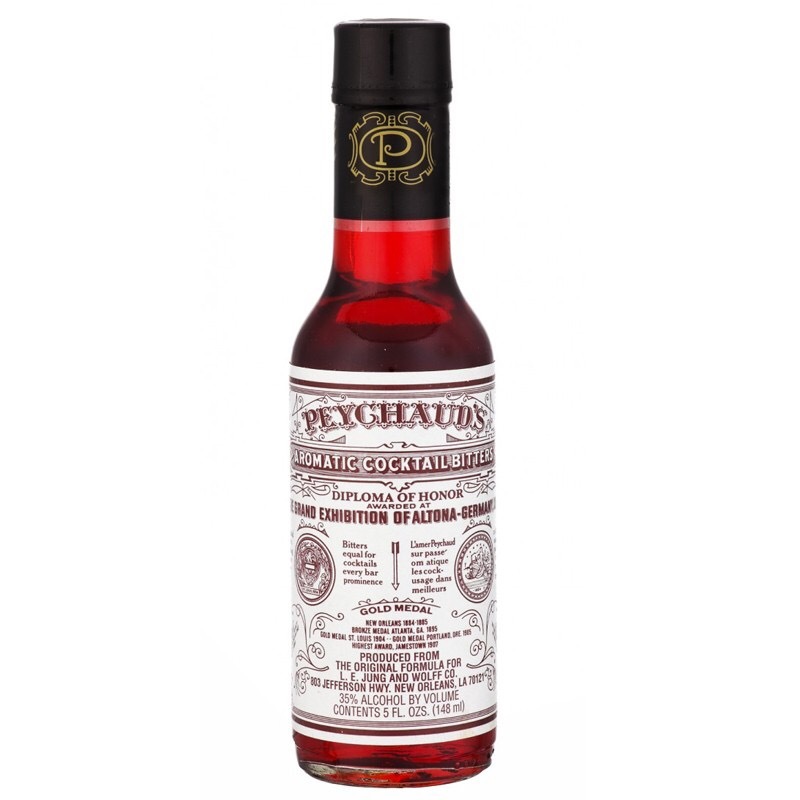 Peychaud’s Bitters, which is a must for the Sazerac, was also created in New Orleans. A gentian-based bitters, Peychaud’s is comparable to Angostura bitters, but with a lighter body, sweeter taste, and more floral aroma. Not hitting The Big Easy anytime soon? Peep the deets below for the mixology. Rinse a chilled old-fashioned glass with the absinthe, add crushed ice and set it aside. Stir the remaining ingredients over ice and set it aside. Discard the ice and any excess absinthe from the prepared glass, and strain the drink into the glass. Add the Lemon peel for garnish. Can’t find Peychaud’s in your local wine and liquor store? You can purchase it here on Amazon. Until then, laissez les bons temps rouler!